Digital signage, also known as dynamic digital signage or multimedia digital signage, is the use of digital content projected through LED, LCD or plasma screens. Technology is constantly changing and continuously alters the way in which we interact with our surroundings. Signage has also evolved, with digital solutions becoming an essential resource that provide us with increased flexibility in how our messages are communicated. It allows information to be presented dynamically, so that content information can quickly be updated to create a user-friendly interaction. It converts the static to the dynamic. Digital signage allows content to be displayed quickly and dynamically, either replacing or accompanying traditional signs. It also allows precise scheduling that can be tailored to specific days, timetables or systems that meet the needs of our customers, with their end users in mind. Our journey at Signes has allowed us to assess each case individually and to offer the best possible solutions within a wide range of options, so that we can provide the right solution for the right problem with the right budget. From hardware to bespoke software, to dedicated content managers that help make maintaining and displaying message content easy. Our experience across a range of sectors means we can create custom projects using different technologies and the industrial design that best fits each group. 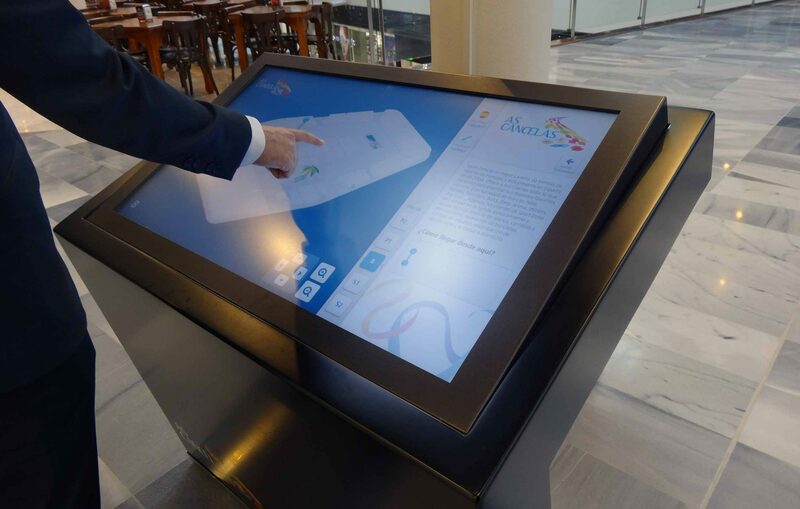 These are very useful in shopping centres, hospitals, museums, hotels, etc., where information can be easily changed, modified and updated using the relevant software. To show information or advertisements, images and/or videos. Using RGB illuminated fixtures. These are very versatile since you can achieve the desired colour or colours required at the time with limitless programming possibilities.